Summer has arrived, it’s time to fire up the grill. 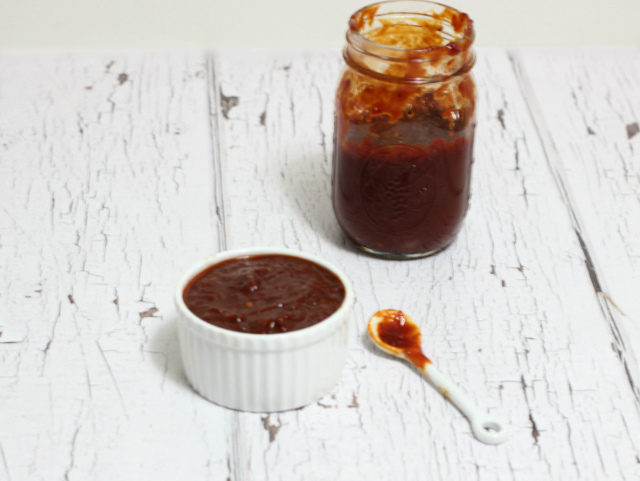 You’ll need this recipe for Bourbon BBQ Sauce. It’s gluten-free and refined sugar-free, two things hard to find in sauces at the store. You won’t want those sauces anyway after you taste this one! I’m from Kansas City, the Barbeque Capital of the World. Our grocery stores have large selections of bottled sauces, Some most of an aisle, many from BBQ joints right here in town. And when you eat BBQ out, the restaurants will have bottles of sauce available to take home. I’m going to guess we eat more tomato-based BBQ sauce per capita than any other city in the nation. It’s a good thing they also sent a nice selection of organic fruit. 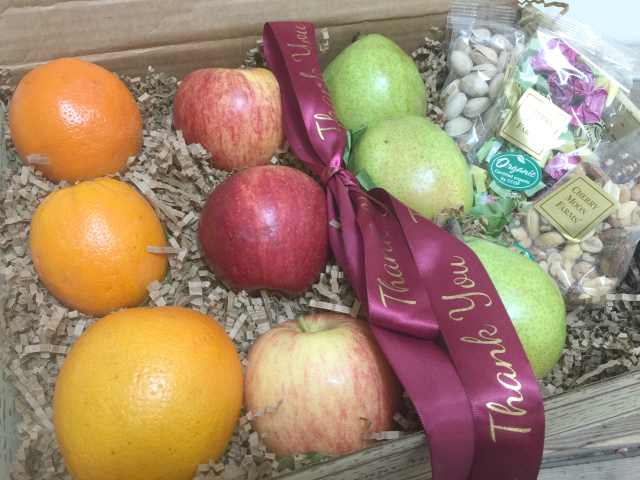 (Did you know Shari’s Berries does all sorts of gift boxes, including these healthy ones? I sure didn’t!). I had plenty of healthy snacks to sample while I thought more and more about using these spices in a concoction worthy of Kansas City-style BBQ. The only solution was to hit the kitchen and start experimenting with sauces. And then it happened: after sharing samples of each experimental batch of sauce, the kitchen became a BBQ sauce factory. Those who sampled the sauce were asking for more. Then they started asking if they could buy it for gifts. (Umm, NO. But I’ll make a jar for you…) We’ve had this sauce on burgers, on grilled kabobs, on grilled tofu, even in macaroni and cheese. That’s one of my favorite places for BBQ sauce, but I’m sure my fellow Kansas Citians can top that. Surely one of you eats BBQ sauce on ice cream or atop chocolate cake? 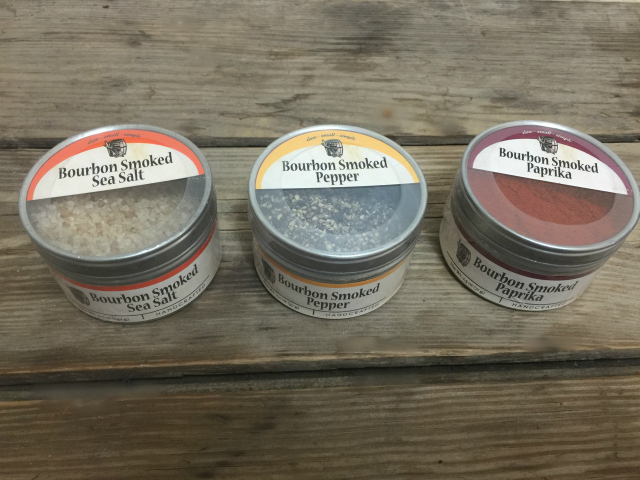 Choosing a bourbon: If it’s not good enough to drink, it’s not good enough for your BBQ sauce. I’ve made this Bourbon BBQ Sauce with Woodford Reserve, Military Special (which is only available on military bases) and Knob Creek. Each resulted in a slightly different flavor, each very good. If you lean toward a sweeter sauce, go with Knob Creek. The spices: I’ve used the spices the folks from Shari’s Berries shared with me. These are smoked over repurposed bourbon barrel staves, imparting a smoky, rich flavor. If you don’t have these in your kitchen, feel free to use regular sea salt and black pepper. But by all means, splurge on a smoked paprika. It belongs in your spice cabinet. I love it on popcorn and stir a little into my pimento cheese spread. Alright. That’s everything you need to know…except how to make the sauce. Here ya go. Make sure you drop back by after you make this and let me know how you used the sauce. Enjoy! In a large saucepan, heat grapeseed oil and red pepper flakes over medium oil until warm. Add the grated onion. Cook over medium for approximately 5 minutes until onion becomes translucent but does not begin to brown. Add the minced garlic and cook for one more minute. Remove the pan from heat. This is especially important if you are using a gas cooktop. Once removed from the heat, add the bourbon. Return to heat and bring mixture up to a simmer. Cook for 5 minutes to allow bourbon to reduce. Next add all remaining ingredients. Whisk or stir to combine well. Cook on low/medium-low for 20 to 30 minutes until sauce has reduced to the thickness you prefer in a BBQ sauce. I cook mine for 30 minutes, however some have preferred this sauce to be cooked as little as 15 minutes for a thinner sauce. Allow to cool and store in jars. This sauce should be kept refrigerated. « Peanut Butter Banana Bread, gluten-free, dairy-free, egg-free and vegan! I love BBQ sauce! 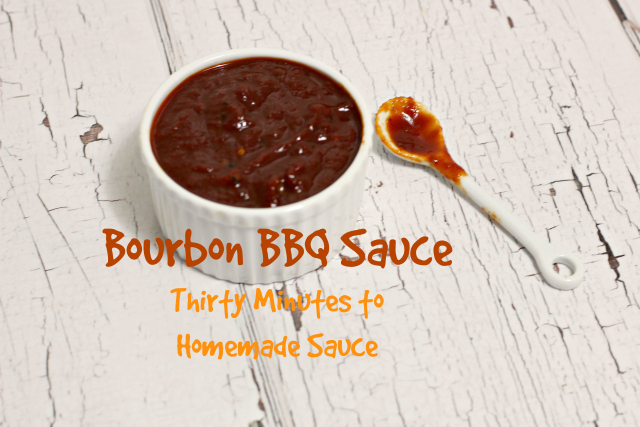 I have never made my own BBQ sauce, but this sauce sounds awesome! Plus, there’s bourbon involved which is just so fun! Thanks for sharing, definitely will try out soon! Bourbon makes anything better, but especially BBQ sauce. Enjoy!